Peptide QPSQDELKDNTTVFTR(C), corresponding to amino acid residues 28-43 of rat GABRA1 (Accession P62813). Extracellular, N-terminus. Homology Mouse - identical; human, bovine - 16/17 amino acid residues identical; chicken - 14/17 amino acid residues identical. Standard quality control of each lot Western blot analysis (unlabeled antibody, #AGA-001), and immunohistochemistry (labeled antibody). Immunohistochemical staining of mouse and rat hippocampal dentate gyrus using Guinea pig Anti-CaV1.2 (CACNA1C) Antibody (#AGP-001) and Anti-GABA(A) α1 Receptor (extracellular)-ATTO-488 Antibody (#AGA-001-AG) in the same section. Both CaV1.2 (red) and GABRA1 (green) are detected in neuron-shaped cells (arrows). Staining suggests partial colocalization between CaV1.2 and GABRA1 in a sub-population of rat dentate gyrus neurons. A. Mouse hippocampus. B. Rat hippocampus. 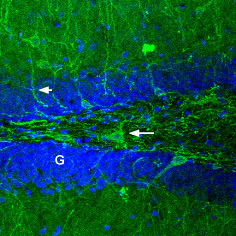 Immunohistochemical staining of rat dentate gyrus using Anti-GABA(A) α1 Receptor (extracellular)-ATTO-488 Antibody (#AGA-001-AG) (green). 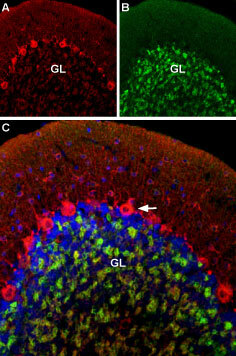 Staining reveals hilar neurons (arrows) and fibers coursing through the granule layer (G). DAPI is used as the counterstain (blue). Rat primary hippocampal neurons (Sarto-Jackson, I. et al. (2012) J. Biol. Chem. 287, 14201.). Cell surface detection of GABRA1 in intact living rat pheochromocytoma (PC12) cells. 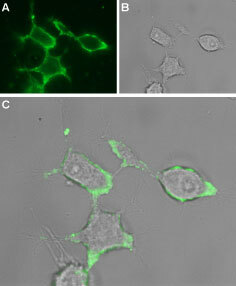 A. Extracellular staining of cells using Anti-GABA(A) α1 Receptor (extracellular)-ATTO-488 Antibody (#AGA-001-AG), (1:25), (green). B. Live view of the cell. C. Merge image of A and B.
Owens, D.F. and Kriegstein, A.R. (2002) Nat. Rev. Neurosci. 3, 715. Neelands, T.R. et al. (1999) J. Neurosci. 19, 7057. GABAARs are heteropentamers, in which all five subunits contribute to pore formation. To date, eight subunit isoforms have been cloned:α, β, γ, δ, ε, π, θ, and ρ.1 Six α subunit isoforms have been found to exist in mammals (α1-α6). In most cases, native GABAA receptors consists of 2α, 2β, and 1δ subunits. The α subunit is the most common and is expressed ubiquitously. It determines the affinities of GABAARs for allosteric ligands. Immuno-colocalization of CaV1.2 and GABA(A) α1 Receptor in rat cerebellumImmunohistochemical staining of rat cerebellum using Guinea pig Anti-CaV1.2 (CACNA1C) Antibody (#AGP-001) and Anti-GABA(A) α1 Receptor (extracellular)-ATTO-488 Antibody (#AGA-001-AG). A. CaV1.2 (red) is detected mostly in Purkinje cells (arrow). B. In the same section, GABRA1 (green) is observed in the granule layer. C. Merge of the two images suggests some colocalization between CaV1.2 and GABRA1 in the rat granule layer, but only CaV1.2 appears in Purkinje cells. Anti-GABA(A) α1 Receptor (extracellular) Antibody (#AGA-001) is a highly specific antibody directed against an extracellular epitope of the rat protein. The antibody can be used in western blot, immunohistochemistry, and immunocytochemistry applications. It has been designed to recognize GABRA1 from human, rat, and mouse samples. Anti-GABA(A) α1 Receptor (extracellular)-ATTO-488 Antibody (#AGA-001-AG) is directly labeled with an ATTO-488 fluorescent dye. ATTO dyes are characterized by strong absorption (high extinction coefficient), high fluorescence quantum yield, and high photo-stability. The ATTO-488 label is analogous to the well known dye fluorescein isothiocyanate (FITC) and can be used with filters typically used to detect FITC. Anti-GABA(A) α1 Receptor (extracellular)-ATTO-488 Antibody has been tested in immunohistochemistry and live cell imaging applications and is especially suited for experiments requiring simultaneous labeling of different markers. Sarto-Jackson, I. et al. (2012) J. Biol. Chem. 287, 14201. Anti-GABA(A) α1 Receptor (extracellular) Antibody (#AGA-001), (for western blot analysis).